At its peak in 2013, Gitanjali stock was trading over Rs 600. On February 19, it closed at Rs 33.80. Mehul Choksi, once the poster boy of India’s booming diamond trade, is now a wanted man for his alleged collusion in a $1.77 billion fraud at Punjab National Bank. The chairman and managing director of Gitanjali Gems has been missing from the country since January. Though his nephew, and main accused in the case, Nirav Modi, is the one in the spotlight, Choksi’s alleged involvement has opened up a can of worms for the jewellery baron’s Rs 16,573 crore business empire spanning several continents. In the past few days, several of his personal and official premises have been raided by sleuths over letters of undertaking of Rs 4,886 crore fraudulently issued to three of his companies. The 58-year-old Mumbai-based businessman was dealt another blow after a former employee alleged that the diamonds sold by Gitanjali Gems, a company that rose to fame in the mid-1990s after Choksi took reigns of his family business, were often fake and produced in labs. These spurious stones drew margins as high as 90% for the firm, the former employee alleged. Gitanjali’s three-decade rise saw furious overseas expansion, a stock-exchange listing, market manipulation, and mounting debt – all amid dazzling brand launches. Born into a family of Gujarati traders, Choksi joined the business that his father had established in the 1960s. It was in 1986 that Choksi launched Gitanjali Gems, which went on to become a top exporter of rough and polished diamonds and jewellery to wholesalers and retailers. Over the years, its export trade expanded to Belgium, the US, West Asia, Japan, China, Hong Kong and Thailand. This helped Choksi, who attended the GD Modi College in Gujarat’s Palanpur, gather wide experience in the diamond trade. However, it was in the early 1990s that Choksi sensed a massive retail opportunity. 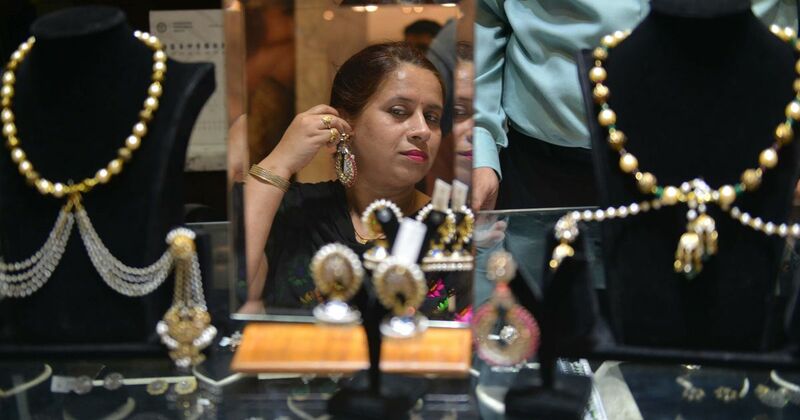 For years, Indian households have bought gold and diamond jewellery from trusted family jewellers. Preferences began shifting slowly as more shoppers in the ’90s bought branded and smaller pieces of jewellery. Many brands such as the Tata Group-owned Tanishq sought to tap into this urban Indian market. In a marked shift from manufacturing and exports, Gitanjali launched its own jewellery brand, Gili, in 1994. Margins were higher in this segment and Choksi’s brands and businesses were backed by management gurus and Bollywood celebrities alike. Over the next decade or so, Gitanjali expanded its retail footprint at home and abroad. Choksi’s ambition was clear. “The next LVMH will be born out of India,” he told Forbes in a 2009 interview, referring to the group that owns the international luxury brand, Louis Vuitton. As of 2016, Gitanjali’s network of own stores (pdf), shop-in-shops, and franchise outlets were spread across 200 cities and 3,000 points of sale in India. These include brands such as Gili, Nakshatra, Asmi, Sangini, Nizam, and Parineeta. Soon, the retailer was eyeing acquisitions abroad and planning to get listed. In 2006, Gitanjali raised nearly Rs 330 crore from the stock market to “set up additional diamond and jewellery manufacturing facilities in Mumbai, at the proposed Gems and Jewellery Special Economic Zone in Hyderabad, and also continue to expand our retail operations,” the company said in a Draft Red Herring Prospectus then (pdf). The firm then issued foreign currency bonds worth $110 million, helping Choksi fund his expansion plan. Gitanjali also signed various joint ventures and distribution agreements with foreign brands to retail their products in India and overseas, giving it a certain clout in the market. Meanwhile, it continued to strengthen its association with retailers, splurging on acquisitions. For instance, in 2006, it spent Rs 200 crore to acquire close to 100 stores of the US-based Samuels. In November 2007, the firm bought out another based US-based speciality retailer, Rogers, for an undisclosed amount. In 2008, Gitanjali increased its stake to 100% in the De Beers-owned Nakshatra brand, which was already being sold through 480 stores in India. In 2011, it acquired four Italian brands from a unit of Dubai-based Damas International. It also has a minority stake in a Japanese jewellery chain. At the peak of Gitanjali’s success, Bollywood celebrities like Aishwarya Rai, Katrina Kaif and Kareena Kapoor were associated with its various brands. In 2008, after Kaif was appointed Nakshatra’s brand ambassador, sales grew over 60% in less than a year. At its peak in 2013, the Gitanjali stock was trading over Rs 600. On February 19, it closed at Rs 33.80. Its market capitalisation was down to Rs 400 crore on the same day. In 2013, it had touched Rs 6,000 crore. Since 2012, things have been turbulent. In 2013, the stock spiralled downward over mounting debt, working capital requirement, weak domestic demand, tightened government policies, and a restructuring plan that spooked investors and traders alike. 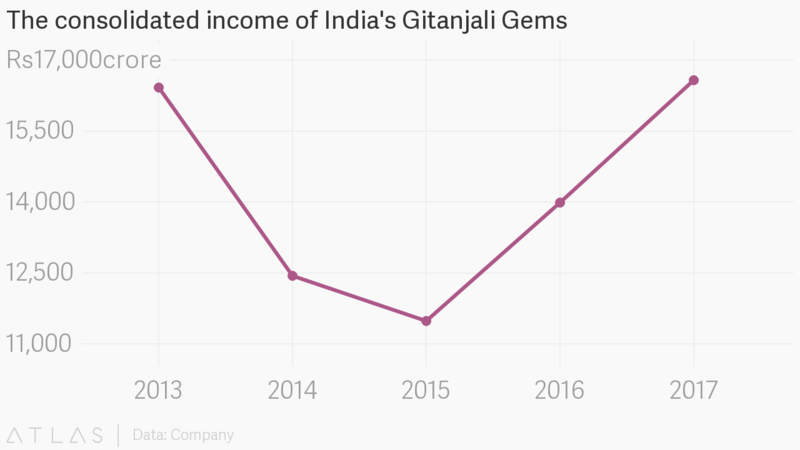 Stressed liquidity position of Gitanjali Gems as evidenced by the full utilisation of existing working capital limits, which, along with the recent RBI guidelines on gold import for domestic purpose, would further put pressure on its liquidity position. CARE also takes into account the erosion in share price and a market capitalisation of the company in the last two weeks of June, which in CARE’s opinion would have a weakening effect on financial flexibility and liquidity. Nevertheless, following a prolonged slump in domestic gold demand, Choksi set forth on the restructuring exercise to bring down costs and focus on diamond jewellery and exports. But matters only got worse. Choksi is now an accused in a scam that could shake up India’s banking industry. As the jeweller’s role in the crime is uncovered, the man who once had India’s who’s who at his disposal seems to be sliding deeper into a rut. His days of dazzling may finally be over.